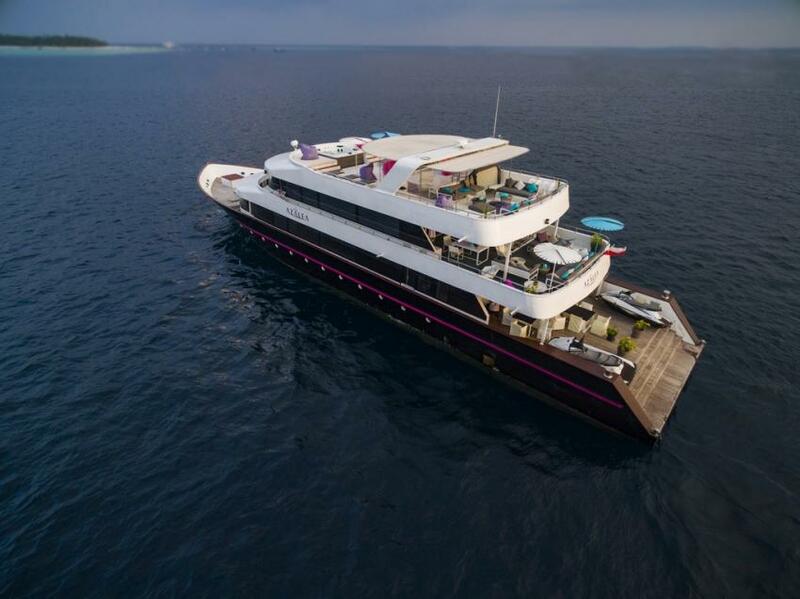 Azalea is a luxury new liveaboard that offers diving cruises on Maldives. Azalea has a new comfortable boat, she can welcome 18 persons. She offers 9 cabins on lower and main deck. 9 Superior Twins are en-suite and have air conditioning. Main deck cabins are more spacious and feature with a gorgeous view. they are comfortable and give you a true sense of the holiday. Lounge area is perfect to relax after diving day, chat with other passengers on board. Big and cozy couches, entertainment facilities and big windows, and you can see blue water of Maldives through it. Also, there is a marvelous sundeck with a shaded part and numerous of sun loungers and a jacuzzi on it. that gives you, even more, relaxation combining with a view of a blue Maldivian water. Meal are served in dining area od Azalea Liveaboard. Boat offers a fine cuisine and excellent choice of wines. Dive deck of Azalea equipped with facilities needed for nitrox fillings. Also, all equipment can be rented on board. Azalea crew team cares about the highest level of safety on board. All necessary facilities is provided. Azalea Liveaboard offers to discover the best that Maldives have. Together with this boat divers can visit central atoll, deep south atolls of Maldives. Itineraries of Azalea includes visiting of South and North Male Atolls, Baa, Thaa and Laamu Atolls. Maldives Atolls is a true paradise for divers. They can observe different colorful coral reefs, home for many fishes. Maldives famous for diving with big mantas and whale sharks. Time from November to May is the best to visit Maldives, although mantas, sharks can be met here through the year. The Boat The boat is one of the newest on Maldives (it was built in the end of 2015). This is noticeable for its interior design. The meal is a full board in a buffet style, but the food is really varied. We had the opportunity to choose from fish, chicken, beef, sashimi, shrimps, vegetables and fruits. We have to give chef his due (he's local by the way), everything was delicious. Other services such as alcohol or dive equipment renting are for extra price. What concerns Azalea, they also make a night barbecue trip to the most distant sandbank of Vaavu Atoll (the closest island is about 20 km away) The boat could be divided into 3 decks and plus a sun deck. There are 6 Standard cabins, a few stockrooms and a crew cabin on the ground deck. They are small, but comfortable (nobody complained). On the main deck there are two Junior Suite cabins and one large and the most expensive - Master Suite. There is a dining area on that deck as well. Breakfast and lunch are served inside and the dinner is outside. There's an entertaining area with comfortable sofas, bar, music and TV on the upper deck. And on the very top there is a sun deck where you can sunbathe or chill out in a jacuzzi. The itinerary. The cruise usually lasts for 7 nights and 8 days visiting up to 3-5 Atolls. There are about 15-18 dives including 2 night dives in total. But in my case, the trip was shortened for one day. Day 1 I was met at the airport and accompanied to the dhoni boat which usually anchors near Hulhumalé. Then we checked in and had a lunch. Later, there was a check dive. After that I went for a dinner. There's no fixed time for breakfast, dinner or supper. It depends on the diving schedule which is made by dive instructor. Day 2 From the early morning, before a breakfast, there is a first dive. After the first day of diving we headed to the South Malé Atoll. All the movements are made during the day and last for about 1-3 hours. The second dive was near Como Cocoa Resort. Apart from the beautiful and colorful corals there's nothing interesting out there. Then we moved to the Vaavu Atoll near Alimatha Resort for night dive. This one is famous for its nurse sharks. There were a lot of divers from other liveaboards. On that day the current was not so strong and most of the sharks were not on the bottom (the average diving depth is about 15 meters), but close to the surface where it was harder to dive because there was nothing to hold on (the current really shifts you). So it's great if we've met at least 10-15 sharks. Day 3 From the very morning the weather started to change and we did another dive near the same resort. The majority of dives we did in the channels with a strong current. There are usually many schools of fish and a lot of sharks, so it was really captivating. This time we were lucky to meet white tips sharks, a few eagle rays , turtles and a huge number of small fish. Soon after the dive we headed to the local island of Thinadhoo. There's a nice spot near it which is called Golden Wall. It's got the name because of the color of yellow color corals which grow there. Besides we've met a sсhool of grey barracuda fish. The last dive of the day was near the most eastern part of the Maldives - Fotteo. Here we had to make 3 dives (it's easy to imagine how much is intriguing under this water). In the evening we were pleased by a surprise - the barbecue on a sandbank in the middle of the Indian Ocean! However the weather became worse, the wind got stronger and ocean got rough as well. It was time to come back to yacht. Day 4 In the strong morning rain and wind we returned to the same spot and did another dive. It was one of the most impressive dive during our safari. Plenty of sharks, schools of fish, colorful corals which I’ve never seen before, wonderful grottoes and small caves - that's why this dive is memorable for. As weather didn't get better, we have to go back. The next dive was near Alimatha Resort (I would note that there are plenty of great diving spots near this resort). And the last dive was in another spot near the resort. Here I've met a very curious turtle who found my camera really interesting. But it's probably because she wanted to taste it After the dive the yacht moved to the Guraidhoo local island and Kandooma Reasort. Day 5 The morning dive was notable for the huge amount of turtles we've met - 5 or 6! I've never seen so many of them in one place before! But that was actually the only cool thing about this spot. Then we've moved several times around North Male Atoll and finally we stopped somewhere in between One&Only Reethi Rah and Coco Bodu Hithi Resorts. Here we were to have a night dive but not in a channel so there was almost no current. Here we've seen plenty of corals which flourish only at night, an octopus and a sea turtle sleeping under the rock. They say it's very unusual. So we were lucky! Day 6 On our last day we finally met manta rays! It's really spectacular although I've seen ten of them before. That was a perfect ending for our diving safari around the Maldives!